These days, Southern football and evangelical Christianity have forged a strong bond. But it hasn’t always been that way. In fact, the article was published about 15 years ago, in the Fall 1997 issue of theJournal of Sport History. I came across it while doing some other research, and the topic naturally interested me (as did the mentions of Auburn University). But keep in mind that basically all of this stuff is his. 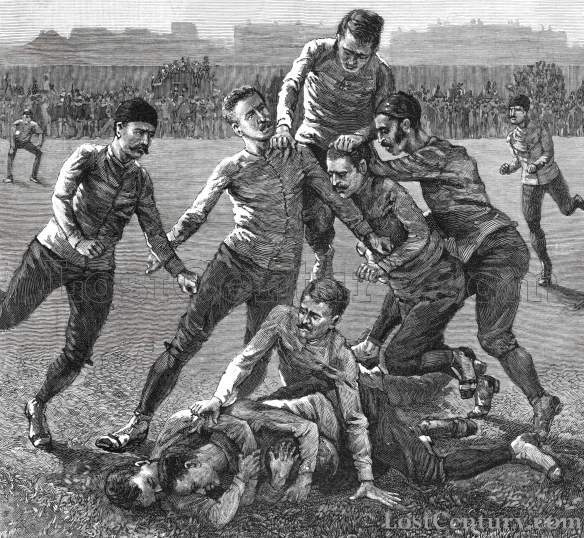 The Auburn-Georgia game in February 1892 is considered the first intercollegiate football game in the Deep South. But the arrival of football did not impress the local clergy. The Rev. C.L. Chilton, pastor of the First Methodist Church in Auburn, declared that this “foolish and useless sport [was] more properly called a fight.” He gave an injury report for both teams, but the sprains and broken bones listed were a denunciation of the spectacle. Chilton, like many church leaders, was concerned that football would overwhelm the academic mission of the Alabama Agricultural and Mechanical College, as it was known as the time. “Here in Auburn, football is the one engrossing theme during the season. The whole thing is a travesty upon higher education,” he complained. Even the daily practices were popular: “Learned professors hasten to the scene of the fray,” he said. Even after Auburn stopped playing Alabama, the Tigers continued to travel to Birmingham to play games. Seeing the students flock to the city’s saloons, the president of the state Women’s Christian Temperance Union asked the Auburn president to stop scheduling games in Birmingham. Unfortunately for the WCTU, the bigger cities provided bigger ticket sales, so the request was ignored. As part of the greater debate on the usefulness of sports like football, many pointed to its role in building strong young men imbued with a commitment to teamwork and sacrifice toward a common goal. It’s amazing to think that because of the pressure, the University of Georgia trustees banned football shortly after the first Auburn-Georgia game, though they caved to pressure from students and the media a year later. The University of Alabama restricted the Alabama team to home games. That restricted football so much that Alabama played only four games overall in 1896 and 1897, and did not field a team at all in 1898. Eventually, of course, all of this changed. The evangelical church has come around, and institutionally speaking is one of football’s biggest supporters. And the University of Alabama even allows its team to play away games (though getting them to the Auburn campus would take a few more decades).